In 1924 the first neon sign in the United States was posted around the corner from Pershing Square. 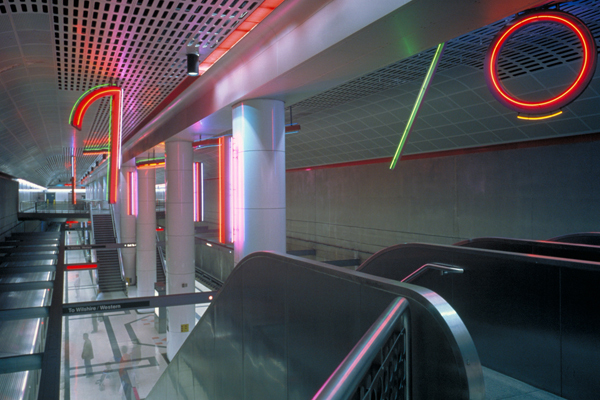 Commemorating this art form, neon artist Antonakos created Neons for Pershing Square, a series of neon sculptures suspended from the station's high ceiling. The twelve sculptures, with their imaginative shapes and bright colors, create an exciting, lively atmosphere in this modern station. This project received a Best of Downtown award from the Downtown News in 1994. "The neons are meant to be seen each for themselves, in combinations and as a total group. The forms are open, allowing architectural elements to be seen through them. This means that not only the columns, the ceiling and the walls, but the space all around them is brought into the experience of the art." STEPHEN ANTONAKOS was born in Greece and immigrated to the United States as a small child. Antonakos began exhibiting his work in the late 1950s and began working with neon ten years later. His work is included in the permanent collections of the Metropolitan Museum of Art, the National Gallery of Art, Philadelphia Museum of Art and the Brooklyn Museum, among others. His work was also included in Documenta 6 (1977) and the 1997 Venice Biennale. Public neon sculptures by Antonakos can be found in cities throughout the world, including Tel Aviv, Tokyo, Athens, New York, Chicago, Denver and Atlanta. Antonakos passed away in 2013.